Caption: Left, yeast sick with too much α-synuclein, a protein that is implicated in Parkinson’s disease. Right, the same yeast cells after a dose of NAB, which seems to reverse the toxic effects of α-synuclein. Many progressive neurodegenerative disorders like Alzheimer’s, Huntington’s, and Parkinson’s disease, are characterized by abnormal clumps of proteins that clog up the cell and disrupt normal cellular functions. But it’s difficult to study these complex disease processes directly in the brain—so NIH-funded researchers, led by a team at the Whitehead Institute for Biomedical Research, Cambridge, MA, have turned to yeast for help. Now, it may sound odd to study a brain disease in yeast, a microorganism long used in baking and brewing. After all, the brain is made up of billions of cells of many different types, while yeast grows as a single cell. But because the processes of protein production are generally conserved from yeast to humans, we can use this infinitely simpler organism to figure out what the proteins clumps are doing and test various drug candidates to halt the damage. The researchers focused on Parkinson’s disease, in which elevated levels or mutated forms of a protein called alpha synuclein (a-syn) wreak havoc on the cell, disrupting everything from protein trafficking to the activity of the cell’s power generators, called mitochondria. Adding to the damage, there can be a rise in the concentration of reactive compounds that damage DNA and other molecules inside the cell. The a-syn protein that poisons neurons in Parkinson’s disease turns out also to be toxic for yeast: engineering yeast to produce too much a-syn makes them sick and slow growing. Taking advantage of this system, the researchers tested about 190,000 compounds to see whether any of those would reverse the toxic effects and allow the cells to grow rapidly again. If a compound could reverse the damage from a-syn in yeast, it might reveal clues about how to do the same thing in humans. Identifying such compounds is critical, because there is currently no cure for Parkinson’s disease—which affects between 750,000 and 1 million Americans. Beyond the implications for Parkinson’s disease, this represents a dramatically new approach to drug discovery. Traditionally, pharmaceutical companies have taken a problematic target—like a-syn or another protein known to be involved in the disease—put it in a test tube, then blasted it with thousands of drug candidates, to see which one could block the clumping or toxic activity. But that doesn’t reveal if and how the drug will work in a whole, living organism. Here’s where the yeast come in: they’re essentially living test tubes. They allow the researchers to see a drug’s impact on an entire organism that’s been genetically modified to mimic the biochemical mechanism underlying a specific disease. It’s an innovative strategy for drug hunting that will likely be extended to other conditions, particularly neurological diseases. 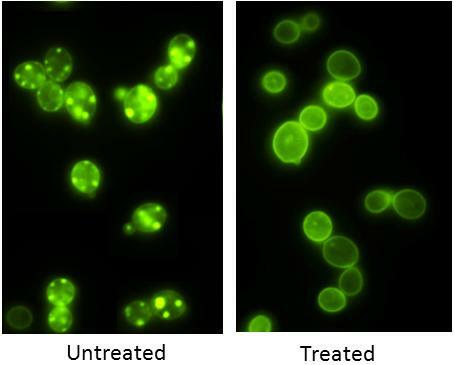 In the latest study, a compound called N-aryl benzimidazole (NAB) corrected the protein-trafficking problems and blocked production of destructive reactive compounds in yeast with too much a-syn. And, very importantly, it prevented a-syn from forming aggregates . The researchers went on to test the compound in an animal model, a worm called Caenorhabditis elegans, and also in rat neurons grown in a laboratory dish. Both models were engineered to mimic the physiology of neurons from Parkinson’s patients. As in yeast, NAB reversed the toxicity caused by a-syn. Then, collaborating with another team at the Whitehead, the researchers tested NAB in cortical neurons that had been derived from induced pluripotent stem cells (which are created from ordinary skin cells) of two Parkinson’s patients who had different genetic mutations—both causing errors in protein trafficking and high levels of reactive compounds. Just as in yeast, C. elegans, and the in vitro rat neurons, NAB largely corrected the defects . So, how does too much a-syn cause all of these problems? With some rather elaborate genetics, the researchers discovered that NAB activates a protein called Rsp5. Rsp5 labels proteins with a particular type of ubiquitin tag (think zip code) that controls the trafficking (think parcel delivery) of certain proteins inside the cell. Too much, or mutant, a-syn actually inhibits these same trafficking pathways. This means that NAB reverses the cellular problems that a-syn triggers. That’s particularly exciting, as NAB is actually modifying a central component of the disease. If this compound, or one like it, were eventually developed into a drug, it would not simply treat the symptoms, but rather it might actually stop the damage to neurons. That’s ultimately what we hope to do for all neurodegenerative diseases. Can the NAB’s derive from other types of stem cells? If so,is there potential for the NAB’s to reverse/heal Periventricular leukomalacia (PVL) damage that resulted in Cerebral Palsy? Thanks for your question, Brad! NAB is a candidate drug that, in the yeast screening system, was able to block the toxic activity of a-syn, which is the protein involved in Parkinson’s disease. However, researchers also hope this new yeast-based approach will open the door to the discovery of drug targets for many other conditions. What mechanisms were used to do the GM, Zinc Fingers, Talens, CRISPRS? Zinc fingers were used for this study, but TALEN or CRISPR technologies would these days be easier options. Fabulous. Could something like this also work when over-aggressive microglia seem to be the culprits causing damage to neurons, as in Myalgic Encephalomyelitis and some definitions of Chronic Fatigue Syndrome? I believe Parkinsons is one of the ubiquintin proteasome ligase disorders. Angelman Syndrome is also, which my son has. From what I was told, the main gene missing in AS causing all the characteristics is UBE3A and it tags proteins but is not degrading proteins. However, it is not exactly clear what proteins, like Parkinson’s a-syn or Alzheimer’s plaques. But am I correct to say that the Rsp5 is equivalent to our UBE3A? We are testing compounds also, but not nearly as many as you have. Anti-inflammatory medications have cured AS in mice, but not humans. We are waiting for results in human trial of any characteristic improvement observed. Topotecan has turned on the silent paternal gene in mice but it is too difficult to reach the brain and therefore too toxic for human trials, as yet. Is NAB also toxic or a dangerous chemical as well? UBE3A is a called a HECT domain E3 ligase, like Rsp5. However, UBE3A adds ubiquitin to proteins so that they are degraded by the proteasome. Rsp5, which is a member of the Nedd4 family of HECT domain ligases, adds ubiquitin to proteins to promote intracellular trafficking events – not degradation. So, while UBE3A and Rsp5/Nedd4 have a similar HECT domain, they have very different functions. Rsp5 is the yeast homolog to Nedd4 (there are 9 in humans), one of which is associated with Liddle syndrome, a rare dominantly inherited disorder marked by severe hypertension b/c a Nedd4 target is not properly trafficked.